Does the Devil Wear Prada…and Gucci…and Hermes…? In 2010, I took some of the first video ever seen from inside an Indonesian reptile slaughterhouse and have written a bit about the business here. Last year, after Swiss filmmaker Karl Amman showed The Medan Connection (viewable below) exposing the inner workings of the trade, Swiss parliament voted to ban imports of python skins from Indonesia on grounds of animal cruelty. Since Switzerland is important to the three major buyers of reptile skins-the fashion houses Hermes, Gucci, Prada-this was significant. In the wake of Amman’s film, the International Trade Center (ITC) of the World Trade Organization in cooperation with CITES launched a project to study the python skin industry. I attended an early meeting in Geneva in which the ITC-CITES skin project was first discussed and because of what I had seen in the field and because of the role Amman’s graphic film had played in prompting the study, I pressed the participants to include humane treatment as part of their report, over the objection of some participants. Since I had begun my legal career specializing in WTO issues, I also questioned whether it was appropriate for CITES as an international trade and conservation body to lend its name to a wildlife effort conducted by the WTO, a commercial treaty organization. Giving a CITES ‘stamp of approval’ to a WTO project was a dangerous precedent, I suggested, and would likely not be tolerated by CITES parties if the WTO were researching trade in more popular wildlife species, such as lions. I questioned whether governments should be funding a study that clearly benefited a small group of powerful fashion houses, who could certainly afford a study, but whose spokespeople claimed ignorance of where their snakeskins came from and how the pythons they bought were killed. 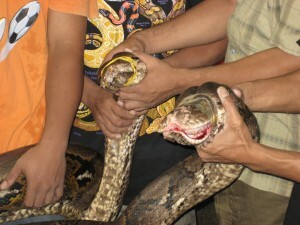 The report, co-authored with TRAFIC and the IUCN, is now out: Trade in Southeast Asian Python Skins. It finds that Indonesia’s method of slaughtering pythons, the bludgeoning method, is “the most humane encountered” in all of Southeast Asia, and determine that it is both a humane and acceptable killing method. Interestingly, rather than call for a ban on skin imports from countries with crueler killing methods than Indonesia’s, the ITC, TRAFFIC and IUCN call upon Switzerland’s upper house to vote against the proposed ban on Indonesian skins on grounds that Switzerland’s ban is “inconsistent and discriminatory,” since Switzerland allows imports from countries whose killing methods are much worse than Indonesia’s. It may be that bludgeoning is the most humane way known to kill pythons on a large scale, but that does not mean Switzerland is wrong to think the practice unacceptable. It is the potential loss of the Swiss market that inspired luxury leather dealers to pay attention to reptile slaughter methods in the first place. Reptiles aside, if you care at all about the evolution of wildlife law, mark this moment. With this report CITES (and TRAFFIC and the IUCN) take a position on the question of commercial non-discrimination, a WTO principle. Three leading brands account for 75% of the retail value of the python trade: HVMH (Hermes), PPR (Gucci) and Prada. Other important luxury brands include: Dior, Burberry, Chanel and Giorgio Armani. The most heavily traded species is Reticulated python: avg 350,000 individuals per year. “Me” and Mr. Slinky the Burmese python “revealed” on NPR Saturday . LISTEN HERE! to the episode, which aired on Peter Sagal‘s Wait, Wait Don’t Tell Me NPR Program. Singapore, 31st August 2011—Authorities in Singapore today announced they have destroyed more than 800 reptile skins seized last year. In September 2010, Singapore’s Agri-Food & Veterinary Authority (AVA) seized five packages containing 470 Reticulated Python Python reticulatus and 363 Water Monitor Lizard Varanus salvator skins sent from Indonesia.